Juan Du was born in Shanxi, China, and initially picked up the violin at age three. At age 14, while a student at the Middle School affiliated with the Xinghai Conservatory of Music, she switched to the viola and continued her studies with Donglei Hou. In 2010, she won the third prize at the Hong Kong International Young Musician of the Year Competition. 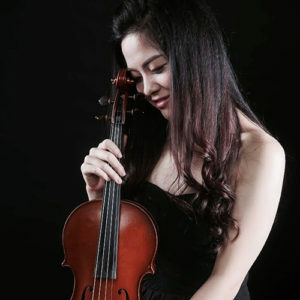 In 2013, she captured the top prize at the Xinghai Cup National Viola Competition organized by the Xinghai Conservatory of Music and was a semi-finalist at the Stulberg International Competition. In 2014, she won a full scholarship to pursue her Bachelor’s degree and study with Mr. Ivan Chan at the Hong Kong Academy for Performing Arts. Ms. Du has been a participant of the Morningside Music Bridge International Music Festival, Kent/Blossom Music Festival, Meadowmount School of Music, among others. She has also had the opportunity to study with the distinguished Steven Tenenbom and perform the Mendelssohn Octet with the Bard Quartet. Most recently, she was a participant of the New York String Orchestra Seminar in New York.